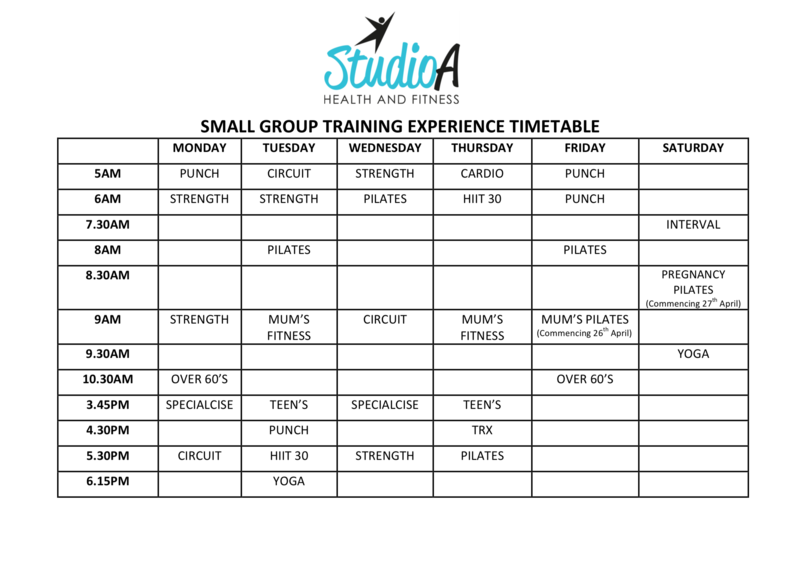 With great pride and excitement, Studio A Health and Fitness presents the Small Group Training Experience. This brand new experience boasts variety, flexibility, small class sizes, and a brand new studio dedicated to small group training! Each small group is strictly capped, which means all participants will receive absolute focus and attention from our very experienced trainers. This will ensure you stay injury free, and are getting the most out of your training sessions. A typical small group training session will consist of a carefully planned and structured workout that will ensure you are working towards your health and fitness goals each and every session. MyZone Fitness Tracking for added motivation and team challenges (a belt will need to be purchased prior to your first class for a once off cost of $65). Check out more information about our packages and training experience here! Want to find out more about each class, and what they involve? Click here now!